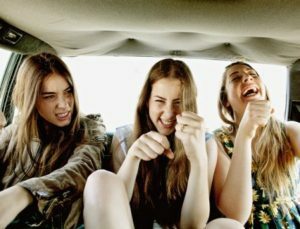 The sibling trio, Haim, are a band I had heard of, but had written off for their membership in a certain teen country star turned pop phenom’s notorious “girl squad.” However, last spring, as I checked out the roster for Gov Ball, I decided to give them a listen. My skepticism was replaced by pure excitement that I can only compare to what I felt when I listened to the synth-pop genius of The Killer’s debut album, Hot Fuss, in 2004. Days Are Gone, evoked the ethereal magic of 70s/80s Fleetwood Mac, with a healthy dose of Stevie Nicks gone solo. It was an album I would listen to in its entirety for several months. Fast forward to spring 2017, and the music world has been buzzing with news of singles from the band’s sophomore release, Something to Tell You, available 7.7.17. I’ll start with the good.”Want you Back” kicks off with a nod to the Indigo Girls. Folk inspired vocals work into a Wilson Philips-esque harmony more typical of the band. On the first listen it took me awhile to get into the song, but when I did, I found myself bopping along the way I do to their previous works. On second listen, I was singing the chorus. I’m sure the third will be when I get hooked. Not quite the captivating experience of Days are Gone first listen, but a respectable offering. Now onto the not quite bad, but bland and disjointed, “Right Now.” The song, like “Want you Back,” sticks to Haim’s favorite relatable theme of star-crossed love, but that’s where the similarity ends. The track is heavy on the vocals and light on the instruments, creating a somewhat uninviting sound. Frankly, I was surprised this is an album teaser. Seems more like the random track you’re willing to overlook when an album otherwise amazes. It never really comes together. There are hints at a promising chorus that doesn’t transpire. Then there is a whisper voiceover midway through that reminded me of Britney Spear’s awkward Titanic interlude in, “Oops I Did it Again” (yes, I went there, but it’s true). What could have been a polished track to draw in fans and new followers, I can only equate to what sounds like the first run of a brainstorm session with instruments mixed in between waiting to be refined. While neither single blew me away, I have much respect and admiration for the musical talents of these three women and am still excited to hear the full release in July. Give them a listen yourself on Spotify. This entry was posted in music and tagged days are gone, haim, music reviews, right now, something to tell you, want you back.